Anna Cherer (LA ROCHELLE, France) on 31 January 2018 in Architecture and Portfolio. What beautiful dazzling reflections. A great image, Anna. Les reflets sont magnifiques, les teintes et le graphisme me plaisent beaucoup! Un très beau tableau abstrait! Très belle journée et gros bisous! J'aime beaucoup ces reflets bien sûr !!! belle photo d'architecture, bon graphisme. Oh, this is really cool ! Amazing detail in a memerising image! That's why I like big cities and their skyscrapers ... they offer so much to a photographer 'with the eye'! 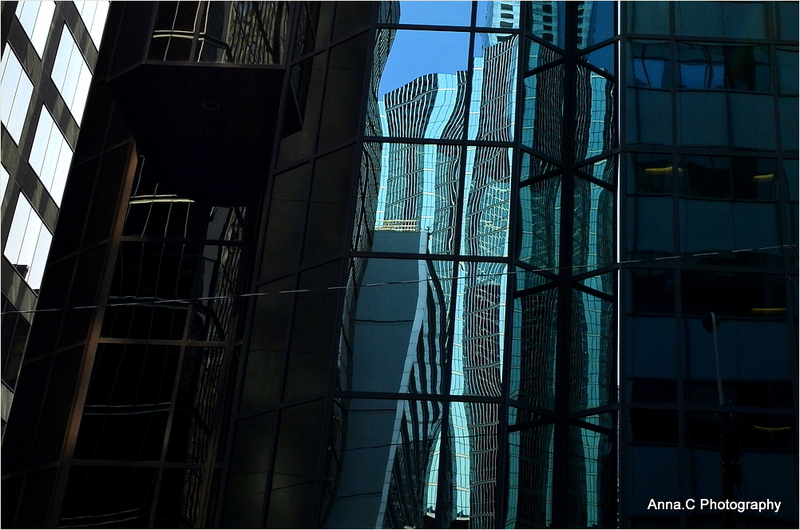 The hallucinogenic dance of glass distortion, always a favourite photographic subject when I walk around downtown. Great framing and result, Anna. Great colors and reflections captured in this facade!! I love the geometric shapes that make up this composition as well. Wonderful reflections that seem to shimmer. That is a really excellent image Anna. Well seen and framed. Couleurs et alliances en reflet joliment embrassées dans le même cadre ténu ! Un très joli dégradé de couleurs...Graphisme extra!